Holden has made a brilliantly concise libretto from O’Casey’s play. Amanda Holden deserves great credit for providing such a strong structure for Turnage to musicalize, for reducing O’Casey’s text so skillfully and for coming up with such singable lines. In many ways her libretto improves on O’Casey’s flawed original as a piece of drama. The Silver Tassie is Mark Anthony Turnage’s third opera, the previous ones being Greek and The Country of the Blind (now withdrawn) and the fourth, and most recent, Anna Nicole. 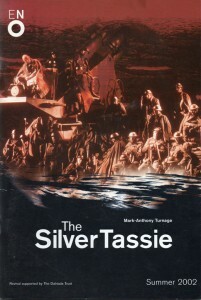 The premiere of The Silver Tassie took place at the London Coliseum on 16 February 2000. Gerald Finley was superb as Harry Heegan, the footballing hero who wins the cup, only to have his life ruined when he loses the use of his legs at the front in the First World War battle front in France. The supporting cast included Sarah Connolly, Vivien Tiernay, David Kempster, John Graham-Hall, Anne Howells and Gwynne Howell. Paul Daniel conducted the show, which was directed by Bill Bryden and designed by William Dudley. The production was shown on BBC2, 30 April 2000 and the CD recording was soon released. 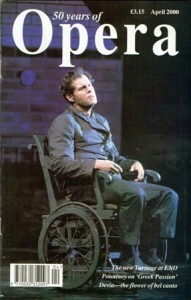 ENO revived the opera, with Garry Magee as Harry Heegan, in June 2002. Meanwhile there were productions in Dortmund (2000, as Der Cup) and in Dublin (2001). In 2001 composer and librettist were awarded the Olivier Award for Outstanding Achievement in Opera. AH: The work was composed over a long period. The libretto was drafted in 1994-95 and the music written 1997-99. Conditions were ideal; I was then living round the corner from Turnage and we had the full support of what was then the ENO studio. The piece was carefully workshopped with many of its future cast. By the time rehearsals began on 4 January 2000 – the cast knew their roles well. Harry’s farewell song in Act I sets a Robert Burns poem which supplied the title of the original play; Turnage thought it is was too short for the length of music he needed for this very important scene; the second verse – which places the poem more firmly into the character – is by the librettist. ‘til I come back to my faithful Jessie. the battle closes thick and bloody. it’s leaving you, my bonnie lassie!